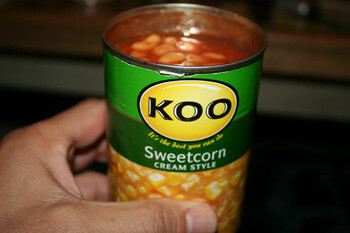 One of the Koo taglines is “It’s the best you can do…” Mmmm….so when you open you your Creamy Sweetcorn you kinda expect it will be the best you’ve tasted in a while…..that is I guess, until you realise your tin is full of beans in tomato sauce. The last time this happened to me was when I was in the army and we had to choose our unlabelled tins of food. You never quite knew what you were getting back then. But let’s face it, this is 2010 and when you grab a tin of Koo, you kinda expect to get what you asked for. Thanks for the surprise Koo, but this one goes down as a Fail. Especially since I already opened my Heinz beans earlier….